Everyone should own a couple LBD’s- one for day, one for night, and so on… this one I bought a few years ago and it’s become a favorite. It’s oh-so comfortable, yet still stylish. 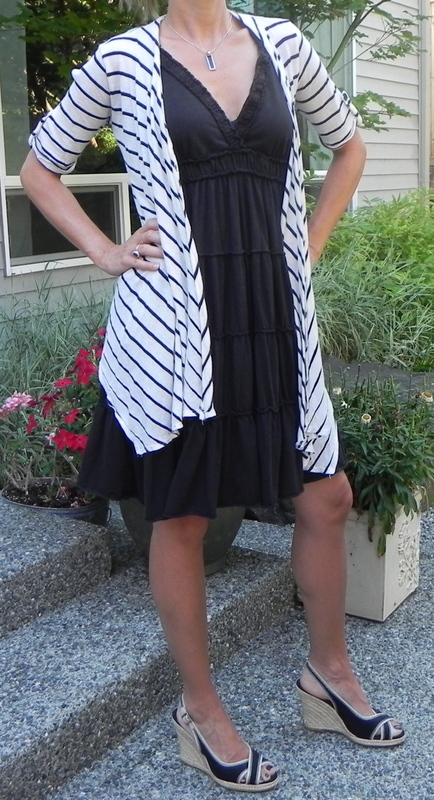 I threw on a striped short sleeved cardigan to add a tiny bit of warmth- but as the day heats up- I’ll can take it off and the dress works well alone. The tiny black necklace and cute black and beige heels pull the whole look together. I LOVE your style! You have a great knack for taking a frumpy outfit and turning it into a stylish, flattering outfit that will make all the other moms jealous! The next time I put on my black T-shirt, cropped jeans and birkenstocks (come to think of it – that is what I’m wearing right now!!) I will take a moment to stop, put the birks back in the closet, add fun jewelry and cute shoes and THEN leave the house! Keep up the inspiring posts – you are helping those of us who are definitely fashion challenged! !